Home of GBCAT, good food, useful software, HAM Radio & good will. What’s new in GBCAT v1.3? – Fixed problem with fonts on Windows XP. – Menu Misc, item “Communication dialogbox” changed to “Easy Start dialogbox”. The first GBCAT start now is much easier than even before because of implemented communication speed dependent automatic Timings. Of course, for those who want to squeeze every ounce of speed, Timings are still configurable. – Kenwood TS-590S bugfix: Sliders for the following controls now are initialized on GBCAT start: USB.Audio.out.Lvl, Acc2.AF-In.Lvl, Acc2.AF-Out.Lvl. – According to many OM’s requests, default configuration value for Squelch now is 0 (no squelch). – Kenwood TS-590S: Missed file for equalization feature now is packed with installation file. – Band Scope improvements: Position mouse pointer and click on signal peak to stop the sweep and set the new VFO frequency (idea by Tim, KM4GUF (former KK4ZRZ)). Added FQ flag shown during band sweep. If you want to disable FQ flag, set signal index to 31. 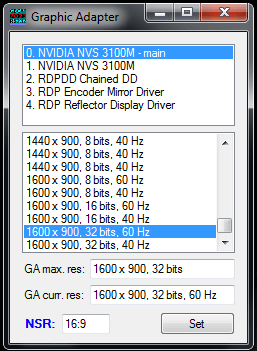 – Added selection “Read Memory content at GBCAT start” in menu Rig/Kenwood: After the first GBCAT start, user is able to skip sometimes bored (but useful) Memory Channel content reading, or he can read it at GBCAT start as usual. If this selection is unchecked, „Set MC“ feature will not be loaded with the current memory channel data. Of course, it always can be loaded later. 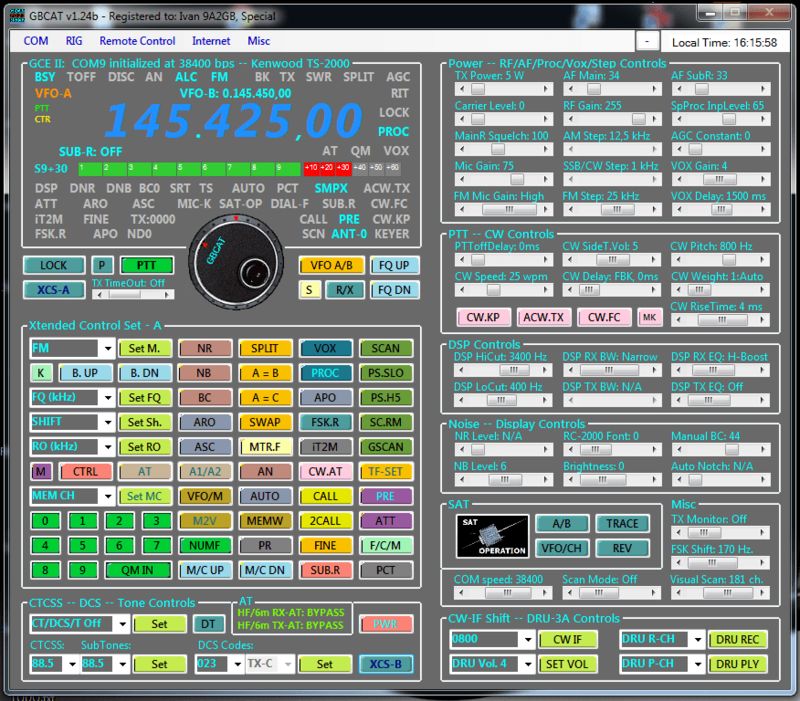 – Added selection “TS-2000 Colored Buttons” in menu Rig/Kenwood: Use it if you like it. – Added selection “Show info ‘Connected device is…’ at GBCAT start” in menu Rig/Kenwood: After the first GBCAT start, user is able to skip sometimes bored (but useful) info “Connected device is recognized as Kenwood…” etc. If you disable Memory channels content reading at GBCAT start, and this feature which also require user interaction, you may have GBCAT up and running within 8-15 seconds from the start, depending on how fast is your PC hardware, especially your hard drive unit. 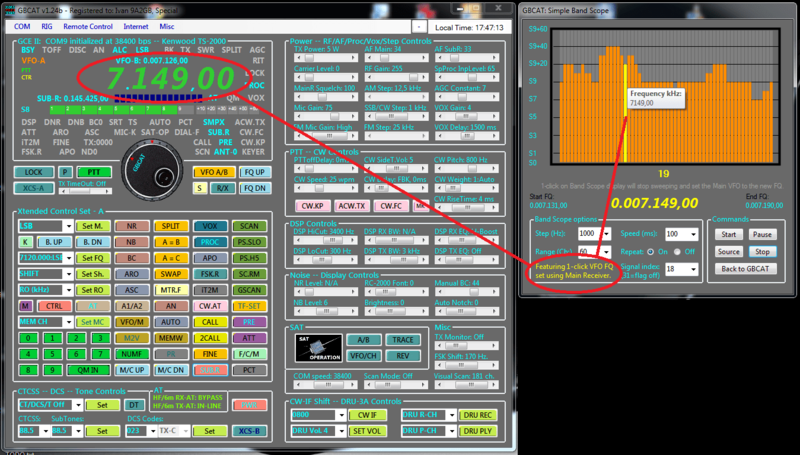 – Added selection “Graphic Adapter settings” in menu Misc: It will show you info about the current graphic adapter settings as well as the NSR info required for an appropriate analog s-meter setting. Close it with the red “X” at the top right, if no changes are made. – The full configurable analog S-meter simulation (idea by Tim, KM4GUF (former KK4ZRZ)) with possibility to load User designed S-meter face plates. – Telnet Client with 1-click set VFO FQ feature, selection between the regular terminal view and tabular view, internal band filtering, approx. QRB calculation in the real time, and many other useful features. There is also a few minor cosmetic changes (a button face plates redesign, the main FQ display without a phantom backgrounds, etc), as well as a few bug fixes which I forgot to write down, because writing manual is a time-consuming process for me. I hope that GBCAT users are power users who will know to find some undocumented changes. If anyone has a good will to update GBCAT manual and thus join to GBCAT development process, also to contribute to the HAM community on that way, please do not hesitate to contact me. GBCAT is free of charge, so any form of your help is welcome. Code is Poetry, Life is Code. Fusion of good food, useful software, HAM Radio & good will. This is a personal blog with no intention to make money of it. I have no commercial ties to any manufacturer or supplier. Links to manufacturers, suppliers or products do not imply that I endorse them in any way. All published materials are property of www.9a2gb.net, if another source is not specified. Copying and publication of articles, images and materials from 9A2GB pages to other media is permitted only with the author's name quotation and with a link to the source page. Ovo su privatne stranice bez namjere da se na njima zarađuje novac. Ne postoje komercijalne veze s bilo kojim spomenutim proizvođačem ili dobavljačem. Linkovi na stranice proizvođača ili proizvoda ne znače da ih podržavam na bilo koji način. Svi materijali objavljeni na ovim stranicama vlasništvo su www.9a2gb.net, ako nije naznačen drugi izvor. Prijenos tekstova, fotografija i ostalog materijala u druge medije dozvoljen je jedino uz jasno navođenje autora i linka na izvornu stranicu. (c) www.9a2gb.net - All rights reserved. www.9a2gb.net ne preuzima odgovornost za točnost, potpunost ili korisnost objavljenih podataka. “Anyone who considers arithmetic methods of producing random digits is, of course, in a state of sin.” - John von Neumann. "I am often asked how radio works. Well, you see, wire telegraphy is like a very long cat. You yank his tail in New York and he meows in Los Angeles. Do you understand this? Now, radio is exactly the same, except that there is no cat." - Albert Einstein. "Believe those who are seeking the truth; doubt those who find it." -Andre Gide. "Three ways to fix things: The right way, the other way, and maybe your way, which is possibly a faster wrong way." Yoda: "Only what you take with you." "I ride Too Far, Too Fast and Too Often, to ride anything but a BMW R1150RT." "Retirement = Every day is a ruby Tuesday except Monday." Twice might not be enough. More than enough is never enough. "The only true apology for wrong action in the past is right action in the future."